Every once in a while I take out this set of stamps and stamp and color them. Especially if I don’t have a card design in mind. This past weekend was really difficult for me. It seemed like all I wanted to do was organize my craft space instead of create. And I’m sure I was missing my Dad. It’s been 11 years since he passed away, but it’s still so hard. So, I got out my trusty unicorns and colored away Friday night. And then they sat there until Sunday, when I finally, sorta had a plan. Originally I had a heart I cut out of MFT’s All Over Roses paper, and I die cut some MFT Scribbles Roses, but it wouldn’t come together. So I kept die cutting shapes lol. I ended up with a heart in my favorite Blue Raspberry (Gina K. Designs). 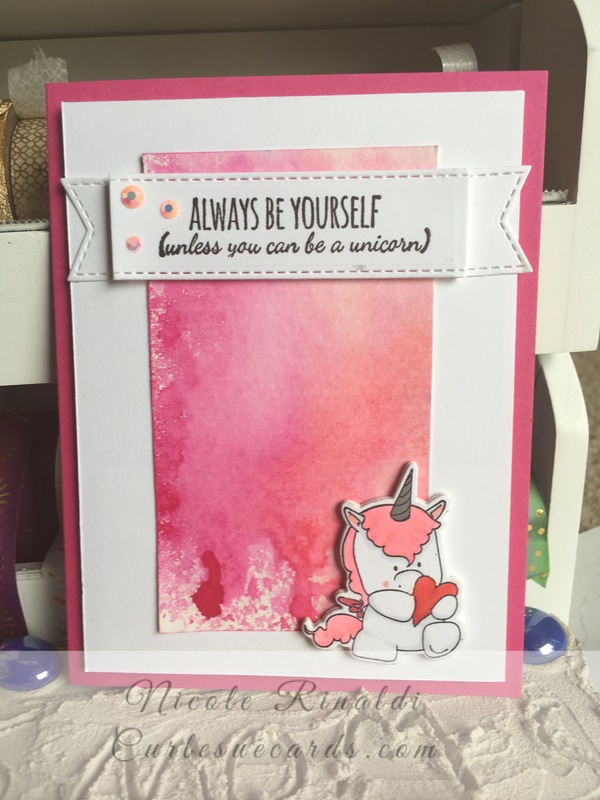 I layered the heart on Neeah Solar White, added the unicorn and then a spunky sentiment from Simon Says Stamps’ CZ Designs Simple Sentiments. Lucy’s Cards jewels finished it off! While fighting with…I mean working on this card, I came across a panel of paper I watercolored with Distress Ink using the smooshing technique. I’ve used theses panels with the unicorns before, so I grabbed a matching unicorn. 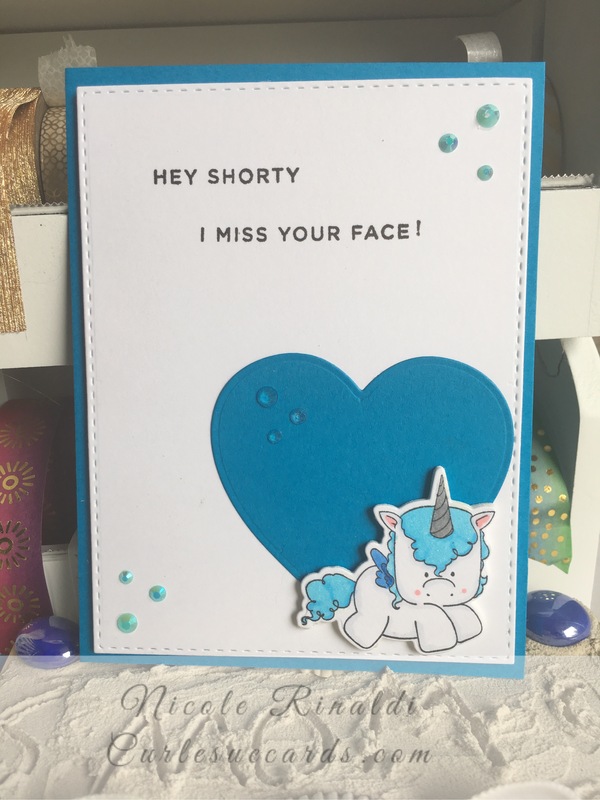 Then I used my new MFT Stitched Fishtail Sentiment Strips and stamped one of the Sentiments that accompany the unicorns. I scored it so that I could get it to pop up, and put some foam tape in the middle. I also used fun foam to pop up the unicorn (I did this on the first card too). I added a couple of Lucy’s Cards jewels to the sentiment strip. These guys cheer me up so much! Maybe I should bring one to work and put it on my desk. Or make planner clips with them! What are your go to stamps for when you are stumped, or need cheering up? Is it possible to get these? Wow.. can I where the shop is? I got it.. will I be able to order online then? Yes, they are available online at http://www.etsy.com/shop/curlesuecards. Right now I only ship in the US. I’m still working out how to ship internationally.